The big flint church of 1886-88 is of some distinction, as befits its cost of £10,700 (KD 1899) and its purpose, which was to carry the ritualist banner in the largely evangelical town (see Worthing introduction). 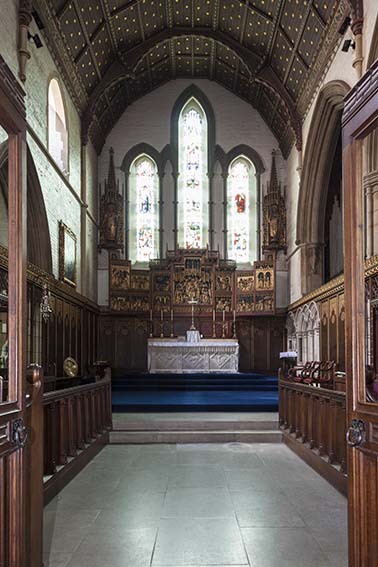 It shows many of the favourite features of its architect, Sir A W Blomfield (BN 51 p895) with mostly lancets, except for four-light windows in the lower transept-chapels. Without the intended octagonal tower over the apsidal north chapel, the exterior lacks a vertical emphasis. Blomfield liked such towers (e g Christ Church, St Leonards, East Sussex). Also typical is the low apsidal baptistery, entered inside through the centre of three west arches beneath long shafted lancets, which are similar to the east ones. The detail is competent, save perhaps for the clumsy way in which the arches from the aisles into the transept chapels are made to rest on the arcade piers. The fittings and glass (for details see below) were from the start much more ambitious than in other churches in the town and most survive. The white walls may not be as Blomfield intended, but otherwise the atmosphere of a late C19 high church remains. 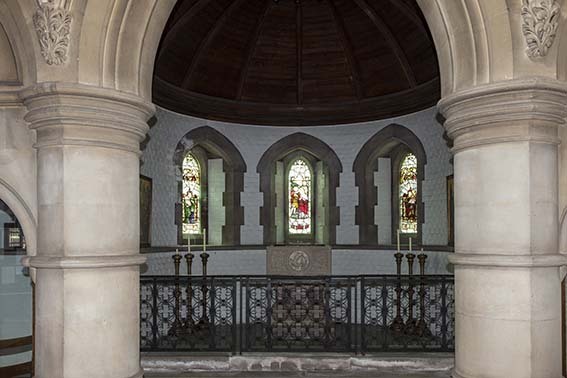 The chancel roof is ceiled and painted, whilst the apse of the north chapel is vaulted. Except for the reredoses (see below), the carving throughout is by H Hems of Exeter (ibid), including the bosses and other architectural carving. Font: This is clearly not the original one since it is very much in the idiom of J Cribb in the form of a tapering cylinder, very like that at Findon Valley nearby, which must date from the 1930s or even later. Its predecessor is said to have had a large square carved bowl by Hems (ibid), with a cover also made by him. 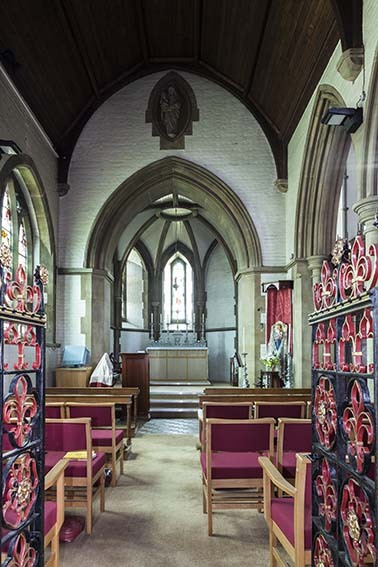 Glass: The east and west windows and the glass in the aisles and clerestory are by C E Kempe. Most consists of single figures dating from 1889 to 1907, even the largest. 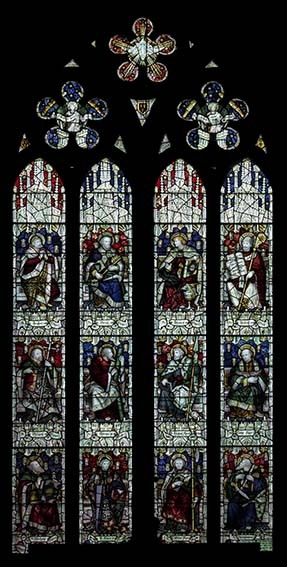 There is also glass of 1907 and 1921 in the south aisle (third window) and north clerestory by Kempe and Co. Some figures came from the demolished All Souls, Eastern Road, Brighton in about 1968 (Beevers, Marks and Roles p96) and there is more from another demolished Brighton church, St James, in the vestry (1 p27). 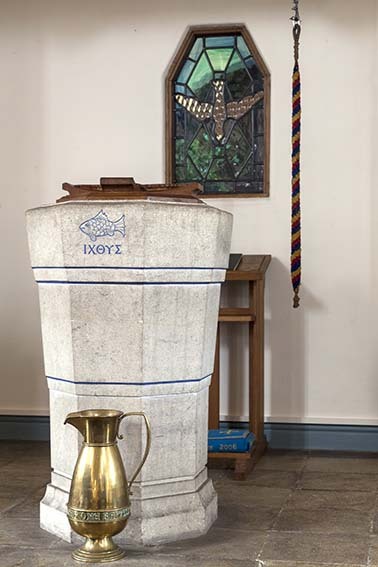 Pulpit: This must be one of the fittings by Hems. 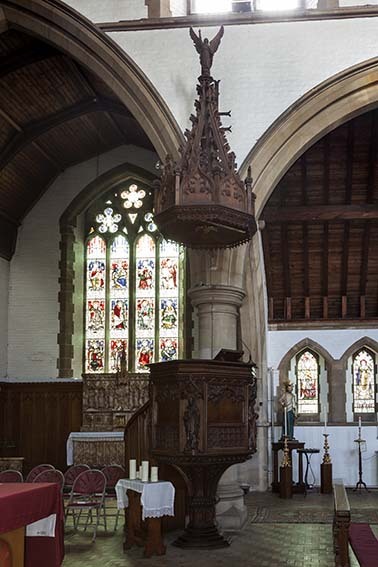 It is surmounted by an elaborate crocketed canopy with an angel at the top. 1. 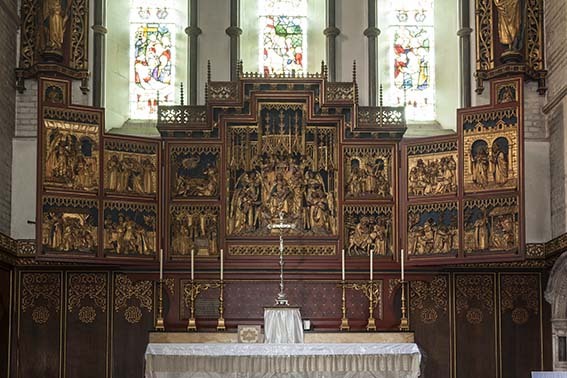 (High altar) Gilded, painted and decorated triptych, carved at Oberammergau to Kempe’s design. The name of the carver is not known. When open it extends the full width of the east end and is an impressive sight. 2. (South transept) Alabaster with carved figures, completed in 1922 to Kempe’s (in fact, presumably Kempe and Co in view of the date) design (ibid p23). 3. 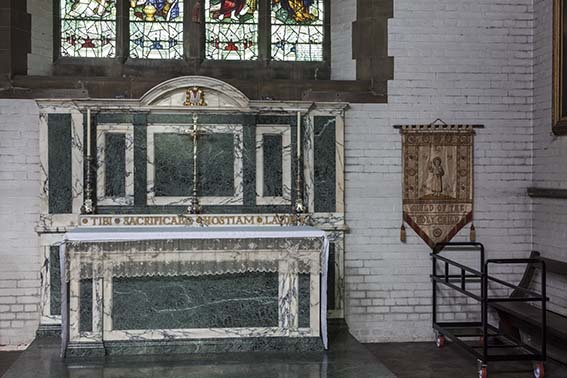 An altar stated to be by Sir C Nicholson (RIBA/F) is probably the one in the north transept with a reredos made of green-grey and white marble. It is in the renaissance style with a rounded pediment over the centre part. 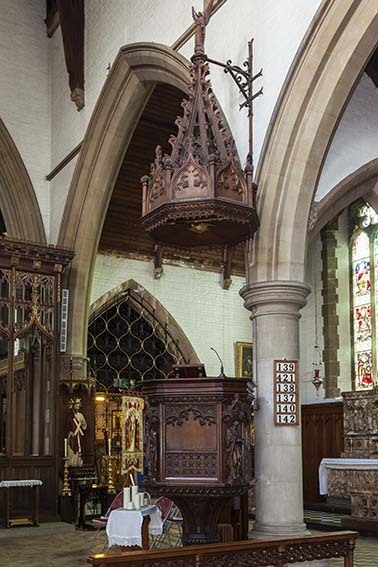 Rood-screen: Largely open with slender verticals and designed by Kempe, 1905 (1 p20). Stations of the Cross: A O Hemming (Church Guide).